Aims: Secreted Wnt ligands are key proteins regulating cell–cell interactions and cell growth and differentiation. These proteins, along with other components of the Wnt signalling pathway, are involved in the malignant transformation of various human cancers, including malignant melanoma. This study defines the expression of several members of the Wnt ligand family and correlates their expression with histological characteristics. Methods: The expression of Wnt2, Wnt5a, Wnt5b, Wnt7b, and Wnt10b was defined by in situ, antisense RNA hybridisation of paraffin wax embedded sections of benign naevi and malignant melanoma. Immunoperoxidase based antibody staining was used to define the expression of frizzled (Fz) receptors. Results: All naevi tested strongly expressed Wnt2, Wnt5a, Wnt7b, and Wnt10b. Melanomas characterised by small, uniform cells expressed each of the Wnts in a pattern similar to that seen for benign naevi. In contrast, melanomas characterised by large, pleomorphic cells expressed Wnt10b but did not express Wnt2 and had low levels of expression of Wnt5a. Expression of Wnt7b was variable in these melanomas. Fz receptor expression was present at a low level in normal epithelium and all naevi and melanomas. Conclusions: The expression pattern of Wnt ligands in malignant melanoma correlates with histopathological features and may provide a basis for the molecular classification of this disease. Wnt5a appears to be especially important in melanoma. Gene array expression profiling has identified Wnt5a as a gene that defines, on a molecular basis, a specific cluster of melanomas,24 and a fivefold increase in Wnt5a expression is seen in up to 50% of primary malignant melanomas.25 However, the precise role of Wnt5a is unclear because it appears to regulate growth in C57MG mammary epithelial cells in a manner counter to Wnt1; loss of Wnt5a activity via antisense transfection is transforming in this system.26 In addition, Wnt5a does not stimulate growth of the dermal papilla, contrary to the activity of Wnt3a and Wnt7a.27 However, other investigators28 have suggested that Wnt5a expression correlates with melanoma invasion and that transfection of Wnt5a cDNA into non-invasive melanoma cells results in increased invasive potential. In our study, we have used antisense in situ hybridisation to define the expression pattern of several members of the Wnt ligand family in benign naevi and melanomas of different histologies. We have also examined the expression of Fz1/2 receptors in these tissues by immunohistochemistry. Our findings suggest that the pattern of Wnt expression correlates with histopathological features. Wnt expression profiling may be useful in the molecular subclassification of human malignant melanoma. Archived, paraffin wax embedded, pathological specimens were obtained under an IRB approved protocol (UCI98–20), following oral and written informed consent. Patients were identified through the Chao Family Comprehensive Cancer Center and the department of dermatology as individuals with recent surgical resection of various types of benign naevi or malignant melanoma. Thirty five patients for whom tissue blocks were available were enrolled in our study. Several types of benign naevi were examined including junctional naevi, compound naevi, intradermal naevi, and blue naevi. Most of the malignant melanoma samples were superficial spreading melanomas, with a smaller number of nodular/polypoid and pagetoid lesions. No acral lentiginous melanomas were evaluated. The level of invasion of the melanomas ranged from level II to level IV, with depth of invasion ranging from 0.33 mm to 2.5 mm. Human cell lines were obtained from the American Type Culture Collection (Manassas, Virginia, USA) and were used as controls for in situ hybridisation and immunohistochemistry. They included: Jurkat, an acute T cell leukaemia cell line maintained in culture in RPMI 1640 medium with 10% fetal bovine serum (FBS); A375, derived from a human melanoma and maintained in Dulbecco’s modified Eagle’s medium (DMEM) with 4 mM L-glutamine and 10% FBS; C8161, a highly invasive malignant melanoma cell line maintained in DMEM and 10% FBS29; and 832C, a malignant melanoma cell line maintained in DMEM and 10% FBS. For in situ hybridisation and antibody staining controls, cells were pelleted by centrifugation, embedded in paraffin wax, sectioned, and prepared in a similar manner to the tissue samples described below. Slides were dewaxed with sequential xylene/alcohol/distilled H2O washes and hybridised with single stranded antisense RNA probes generated from cDNAs using T7 and T3 RNA polymerase promoters in the respective vectors. Probes were labelled with digoxigenin, hydrolysed, and hybridised to tissue sections in a moisture controlled environment at 37°C for 72 hours, under conditions optimised for each probe. Positive hybridisation was detected using antidigoxigenin conjugated to alkaline phosphatase to allow visualisation with an alkaline phosphatase substrate. All slides were counterstained lightly for five seconds with a fast red reagent to permit visualisation of tissue architecture. Probes for Wnts represented non-homologous coding sequences or 3′ untranslated sequences. Probes were prepared fresh and each batch was subjected to a full battery of positive and negative control testing. This battery of positive and negative controls allowed for extensive quality control as follows: (1) each batch of probe was tested initially against control (+) and (−) cell lines, previously defined by northern blot analysis, to ensure adequacy of probe preparation; (2) each analysis of patient tissue included slides stained with antidigoxigenin and alkaline phosphatase reagents to ensure that background staining was minimal; and (3) each analysis of patient tissue included hybridisation with a sense RNA probe to ensure that non-specific hybridisation was minimal. All antisense Wnt probes were specific for an individual Wnt ligand based on testing of paraffin wax embedded control cell lines for which the pattern of Wnt expression had been defined by northern blotting. Any probes that initially exhibited overlapping specificities were redesigned before use in our study. Direct visualisation with an Olympus B50 microscope system with Nomarski optics and digital capture technology was used to define expression. Photographs of tissue and cell line sections were obtained within 48 hours of completion of the hybridisation to minimise slide artifacts that can appear over time. Each tissue specimen was scored as either negative, weakly positive, or strongly positive by at least two separate individuals. One observer was always blinded to information about the specific histological diagnosis and the specific probe used. If a consensus was not achieved, opinion regarding the presence and strength of staining was solicited from a third individual who was similarly blinded. Probes used for in situ hybridisation included Wnt2, Wnt5a, Wnt5b, Wnt7b, and Wnt10b obtained from Genome Systems. The genes and the accession and identification numbers from the Image consortium are listed: Wnt2, AA970688, 1579015; Wnt5a, W49672, 324901; Wnt5b, A1201930, 1859198; Wnt7b, AA991310, 1608881; and Wnt10b, AI144467, 1708905. Because several of the Wnt genes share significant homology, each probe represented sequences from either the 5′ or 3′ untranslated region and confirmation of unique, minimally homologous sequences was achieved with BLAST analysis. Paraffin wax embedded samples of normal skin, naevi, and melanoma were obtained as described above. Polyclonal goat antihuman Fz1/2 antibodies, which react with both human Fz1 and Fz2 cell surface receptors, were obtained from Santa Cruz Biotechnology (Santa Cruz, California, USA). Samples were dewaxed with xylene/ethanol and incubated with primary antibody (2 μg/ml) for 30 minutes at 25°C. This was followed by incubation with biotinylated donkey antigoat secondary antibody (1 μg/ml) for 30 minutes. Sections were then incubated with avidin–horseradish peroxidase for another 30 minutes. Next, two drops of AEC substrate (Sigma Corporation, St Louis, Missouri, USA) reagent were applied to each section and incubated for approximately 10 minutes. This methodology was used rather than standard diaminobenzidine as chromogen to distinguish positively staining cells from melanin pigment present within many of the melanoma sections. Donkey serum was used as a blocking agent to reduce background staining. All benign naevi strongly expressed Wnt2, Wnt5a, Wnt 7b, and Wnt10b (table 1; fig 1). The expression of Wnt5b was strongly positive in some naevi, weakly positive in others, and negative in a small number. The expression of Wnt5b was termed variable (table 1). Like benign naevi, melanomas characterised by small, uniform cells expressed each of the Wnt ligands tested (fig 2). Melanomas characterised by larger, pleomorphic cells expressed Wnt10b and did not express Wnt2. Wnt5a expression was detected in large cell melanomas but the level of expression was substantially less than that seen in the small cell melanomas. Wnt7b expression was variable—it was present in some large cell melanomas tested but absent in others (table 1). Wnt5b expression was variable in all specimens, including the benign naevi (as noted above), small cell melanomas, and large cell melanomas. Normal epithelium (n = 12) strongly expressed each of the Wnt ligands tested, as did hair follicles and sebaceous glands contained within several specimens (fig 2, insert). Melanomas of different Clark’s classifications were distributed approximately evenly between the small cell and large cell groups. The pattern of Wnt ligand expression did not correlate with a particular Clark’s classification or with the depth of invasion. In situ hybridisation demonstrating expression of Wnt ligands in benign naevi. (A) Haematoxylin and eosin staining; original magnification, ×400. (B–F) In situ hybridisation with antisense RNA probes for (B) Wnt2, (C) Wnt5a, (D) Wnt5b, (E) Wnt7b, and (F) Wnt10b on representative samples; original magnification, ×400. Dark purple staining indicates positive hybridisation by probe with specific mRNA. (D) Minimal staining with the Wnt5b probe is seen in this naevus. Brown colouration represents melanin and can be seen clearly in (A) and (D). The strong signal from the antisense RNA probe hybridisation in (B), (C), (E), and (F) obscures the melanin pigment. In situ hybridisation demonstrating expression of Wnt2, Wnt5a, and Wnt10b in melanomas of varying histologies; original magnification, ×400. Haematoxylin and eosin staining of (A) small cell melanoma and (B) large pleomorphic cell melanoma. (A) The white arrows identify melanoma cells. (B) Melanoma cells make up most of the photomicrograph and are readily apparent. Wnt2 in situ hybridisation of (C) small cell melanoma and (D) large pleomorphic cell melanoma. The dark purple staining indicates positive hybridisation. (C) The white arrows identify positive staining in small cell melanoma. No staining is apparent in the large cell melanoma. Wnt5a in situ hybridisation of (E) small cell melanoma and (F) large pleomorphic cell melanoma. (E) The white arrows identify positive staining in small cell melanoma. (F) The insert depicts strong Wnt5a expression in a hair follicle on the same slide from which the large cell melanoma image is derived. The strong staining in the hair follicle contrasts with the very weak staining in the large melanoma cells. Wnt10b in situ hybridisation of (G) small cell melanoma and (H) large pleomorphic cell melanoma. 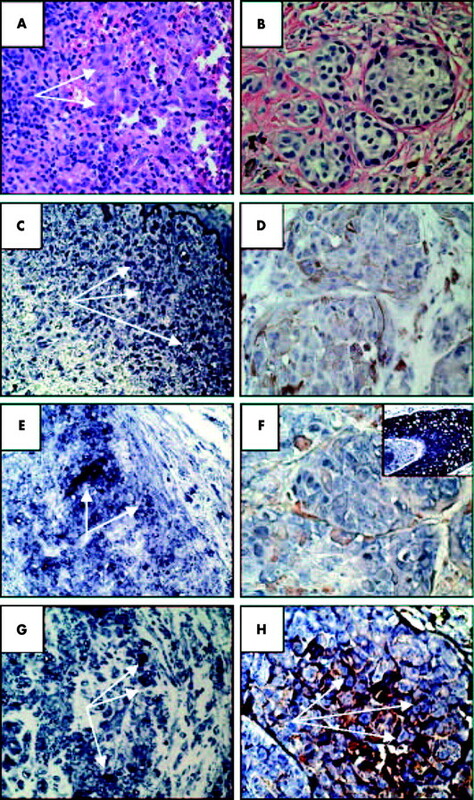 Both histological subtypes display substantial staining with the antisense probe (identified by white arrows in each panel). Low levels of expression of Fz1/2 receptors were seen in normal epithelium, benign naevi, and all types of malignant melanoma (fig 3). The level of expression in large cell melanomas appeared to be the lowest of all the melanomas tested, although definitive quantitation at this overall low level of staining was difficult. In contrast to the normal epithelium, naevi, and melanomas, very strong expression of Fz1/2 receptors was seen in hair follicles and sebaceous glands (fig 3D). 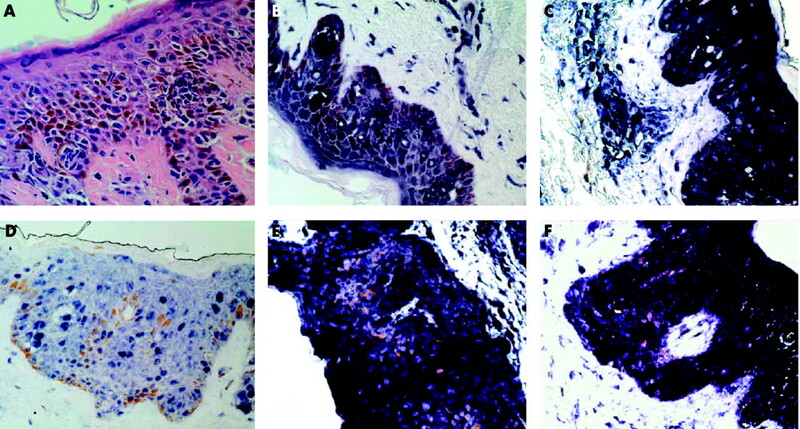 Frizzled receptor expression by immunoperoxidase staining with anti-Fz1/2 antibody in (A) benign naevi, (B) small cell melanoma, and (C) large pleomorphic cell melanoma. (D) Strong expression of the Fz receptor in a hair follicle. Positive expression is indicated by the pink coloured staining and is shown by white arrows in each panel. Black arrows indicate melanin pigment. Original magnification, ×400. In drosophila and other model organisms, the expression of Wnt ligands during development is highly regulated both spatially and temporally.30–33 Earlier work from our laboratory has shown that the expression of most of the Wnt ligands is ubiquitous in colonic mucosa, suggesting that control of Wnt mediated signalling can sometimes involve the regulation of other components of the pathway,34 such as specific Fz receptor subtypes or secreted Fz related proteins which, in general, block Wnt signalling by binding to extracellular ligand, thereby preventing its interaction with the cell surface receptor.35 Analogous to our findings in the colon, we found that normal cutaneous epithelium strongly expressed each of the Wnt ligands tested. Clark37 divided melanomas according to histological characteristics into four groups: superficial spreading melanoma, lentigo maligna melanoma, acral-lentiginous melanoma, and nodular melanoma. Although it is thought that these subtypes relate to the aetiology and pathogenesis of the lesions, they correlate poorly with prognosis,38 especially in comparison with lesion depth. 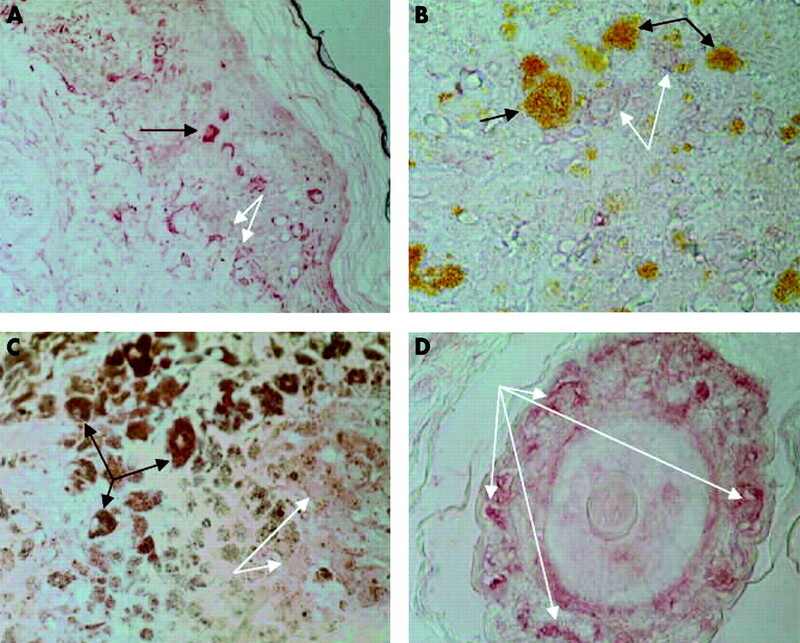 Day et al suggested an additional subclassification based on the histological morphology of melanocytes within melanoma nodules.39 The subtypes—(1) well differentiated spindle cells arranged in follicles, (2) moderate to poorly differentiated spindle and epithelioid cells, (3) polymorphic spindle and epithelioid cells, and (4) epithelioid small cells arranged in discrete nests—appeared to show a better correlation with prognosis and the pattern of metastatic spread than did the Clark classification. One hundred month survival for these types was 100%, 92%, 0%, and 49% (all with regional lymph node metastases), respectively. Our study expands the histological subclassifications by integrating the expression of molecular markers of the Wnt pathway with the histological appearance of the malignant melanocytes within the primary melanoma lesions. The expression patterns of the Wnt ligands correlated best with a histological classification based on the size and pleomorphism of the malignant cells, along the lines of classifications proposed by Blessing and colleagues36 and Day et al.39 No correlation with Clark’s classification schema or level/depth of invasion was seen. In vitro evidence suggests that the expression of certain components of the Wnt pathway, specifically Wnt5a28 and LEF1,22 correlates with invasiveness and metastatic potential. This suggests that understanding the consequences of differential Wnt expression in malignant melanomas may be crucial to providing a more accurate prognosis for individual patients. Specific questions raised by our study include how the reduced level of expression of Wnt2 and Wnt5a in large cell melanomas is important at both a molecular and clinical level. Similarly, it is still unclear what impact the expression of Wnt5b and Wnt7b, which is seen in some melanomas but not others, has on melanoma proliferation, invasiveness, and metastatic potential. The expression of Fz receptors, at least Fz1 and Fz2 for which a specific antibody is available, displayed minimal differences in benign and malignant specimens. The Fz receptors comprise a family of at least 10 members in humans,40 but further investigation may not be warranted based on our results. Our study supports previous gene array based expression analyses24 demonstrating that specific patterns of Wnt ligand expression define particular subgroups of melanoma. We extend these observations to a correlation with melanomas of differing histopathology. However, this pilot survey is too small to have sufficient power for conclusions to be drawn about the clinical relevance of Wnt expression. Further studies on a larger cohort of patients with melanoma will be needed to define whether the pattern of Wnt expression, and especially the expression of Wnt2 and Wnt5a, correlates with clinical outcome and prognosis. The authors thank Dr J L Marsh, Dr M Waterman, and Dr K Linden for their assistance and support in the design and execution of this research. This work was supported by the Program in Cancer Research, Chao Family Comprehensive Cancer Center (RFH) and NIH grant CA-82450 (RFH). Polakis P. Wnt signaling and cancer. Genes Dev2000;14:1837–51. Theisen H, Purcell J, Bennett M, et al. Dishevelled is required during wingless signaling to establish both cell polarity and cell identity. Development1994;120:347–60. Behrens J, von Kries JP, Kuhl M, et al. Functional interaction of β-catenin with the transcription factor LEF1. Nature1996;382:638–42. He TC, Sparks AB, Rago C, et al. Identification of c-MYC as a target of the APC pathway. Science1998;281:1509–12. Howe LR, Subbaramaiah K, Chung WJ, et al. Transcriptional activation of cyclooxygenase-2 in Wnt-1-transformed mouse mammary epithelial cells. Cancer Res1999;59:1572–7. Crawford HC, Fingleton BM, Rudolph-Owen LA, et al. The metalloproteinase matrilysin is a target of beta-catenin transactivation in intestinal tumors. Oncogene1999;18:2883–91. Brabletz T, Jung A, Dag S, et al. Beta-catenin regulates the expression of the matrix metalloproteinase-7 in human colorectal cancer. Am J Pathol1999;155:1033–8. Testu O, McCormick F. Beta-catenin regulates expression of cyclin D1 in colon carcinoma cells. Nature1999;398:422–6. Stutman M, Zhurinsky J, Simcha I, et al. The cyclin D1 gene is a target of the beta-catenin/LEF1 pathway. Proc Natl Acad Sci U S A1999;96:5522–7. Nusse R, Varmus HE. Many tumors induced by the mouse mammary tumor virus contain a provirus integrated in the same region of the host genome. Cell1982;31:99–109. Bienz, M, Clevers H. Linking colorectal cancer to Wnt signaling. Cell2000;103:311–20. Miyoshi Y, Nagase H, Ando H, et al. Somatic mutations of the APC gene in colorectal tumors: mutation cluster region in the APC gene. Hum Mol Genet1992;1:229–33. Potter JD. Colorectal cancer: molecules and populations. J Natl Cancer Inst1999;91:916–32. Rubinfeld B, Robbins P, el-Gamil M, et al. Stabilization of β-catenin by genetic defects in melanoma cell lines. Science1997;275:1790–2. Rimm DL, Caca K, Hu G, et al. Frequent nuclear/cytoplasmic localization of beta-catenin without exon 3 mutations in malignant melanoma. Am J Pathol1999;154:325–9. Ombolt K, Platz A, Ringborg U, et al. Cytoplasmic and nuclear accumulation of beta-catenin is rarely caused by CTNNB1 exon 3 mutation in cutaneous malignant melanoma. Int J Cancer2001;92:839–42. Huelsken J, Vogel R, Erdmann B, et al. Beta-catenin controls hair follicle morphogenesis and stem cell differentiation in the skin. Cell2001;105:533–45. Dunn KJ, Williams BO, Li Y, et al. Neural crest-directed gene transfer demonstrates Wnt1 role in melanocyte expansion and differentiation during mouse development. Proc Natl Acad Sci U S A2000;97:10050–5. Ikeya M, Lee, SM, Johnson JE, et al. Wnt signaling required for expansion of neural crest and CNS progenitors. Nature1997;389:966–70. Takeda K, Yasumoto K-I, Takada R, et al. Induction of melanocyte-specific microphthalmia-associated transcription factor by Wnt-3a. J Biol Chem2000;275:14013–6. Dorsky RI, Raible DW, Moon RT. Direct regulation of nacre, a zebrafish MITF homolog required for pigment cell formation, by the Wnt pathway. Genes Dev2000;14:158–62. Murakami T, Toda S, Fujimoto M, et al. Constitutive activation of Wnt/b-catenin signaling pathway in migration-active melanoma cells: role of LEF-1 in melanoma with increased metastatic potential. Biochem Biophys Res Commun2001;288:8–15. Merril BJ, Gat U, DasGupta R, et al. Tcf3 and Lef1 regulate lineage differentiation of multipotent stem cells in skin. Genes Dev2001;15:1688–705. Bittner M, Meltzer P, Chen Y, et al. Molecular classification of cutaneous malignant melanoma by gene expression profiling. Nature2000;406:536–40. Iozzo RV, Eichstetter I, Danielson KG. Aberrant expression of the growth factor Wnt-5a in human malignancy. Cancer Res1995;55:3495–9. Olson DJ, Gibo DM. Antisense wnt-5a mimics wnt-1 mediated C57mg mammary epithelial cell transformation. Exp Cell Res1998;241:134–41. Kishimoto J, Burgeson RE, Morgan BA. Wnt signaling maintains the hair-inducing activity of the dermal papilla. Genes Dev2000;14:1181–5. Weeraratna AT, Jiang Y, Hostetter G, et al. Wnt5a signaling is able to induce motility and invastion in melanoma cells. Proc Am Assoc Cancer Res2002;43:12. Welch DR, Bist JE, Miller BE, et al. Characterization of a highly invasive and spontaneously metastatic human malignant melanoma cell line. Int J Cancer1991;47:227–37. Marsh JL, Theisen H. Regeneration in insects. Semin Cell Dev Biol1999;10:365–75. Dierick H, Bejsovec A. Cellular mechanisms of wingless/Wnt signal transduction. Curr Top Dev Biol1999;43:153–90. Baker NE. Localization of transcripts from the wingless gene in whole drosophila embryos. Development1998;103:289–98. Noordermeer J, Johnston P, Tijsewijk F, et al. The consequences of ubiquitous expression of the wingless gene in the drosophila embryo. Development1992;116:711–19. Holcombe RF, Marsh JL, Waterman ML, et al. Expression of Wnt ligands and Frizzled receptors in colonic mucosa and in colon carcinoma. Mol Pathol2002;55:220–6. Zorn AM. Wnt signalling: antagonistic Dickkopfs. Curr Biol2001;11:R592–5. Blessing K, Grant JJ, Sanders DS, et al. Small cell malignant melanoma: a variant of naevoid melanoma. Clinicopathological features and histological differential diagnosis. J Clin Pathol2000;53:591–5. Clark WH, Jr. The histogenesis aand behavior of primary human malignant melanomas of the skin. Cancer Res1969;29:705–29. Schuchter L, Schltz DJ, Synnestvedt M, et al. A prognostic model for predicting 10-year survival in patients with primary melanoma: the pigmented lesion group. Ann Intern Med1996;125:369–75. Day CL, Jr, Harrist TJ, Lew RA, et al. Classification of malignant melanomas according to the histologic morphology of melanoma nodules. J Dermatol Surg Oncol1982;8:874–875, 900. Terassaki H, Saitoh T, Shiokawa K, et al. Frizzled-10, up-regulated in primary colorectal cancer, is a positive regulator of the Wnt–beta-catenin–TCF signaling pathway. Int J Mol Med2002;9:107–12.